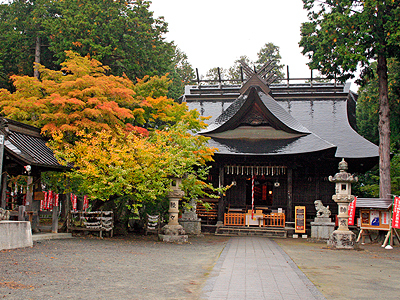 Reside the sothern side of Lake KawaguchiW, Fuji Omuro Sengen Shrine is the oldest shrine in Mt. Fuji area. It is said that the shrine was first marked and worshiped in 699 by Noritada Fujiwara, a courtier, a poet and a ConfucianW on the second station of Mt. Fuji. It was then in 807 when ‘Sakanoue no TamuramaroW’ won his battle against the barbarians in the North that the shrine was built in shape to thank for his victory. However, this shrine has faced many fires caused by eruptions of Mt.Fuji and was rebuilt again and again in the past 1000 years. In 958, Emperor MurakamiW built the Second shrine of Fuji Omuro Sengen Shrine at where it exists today for the accessibility of people to visit and worship. It was in 1974 that the the Main shrine was relocated to the present place, where in the past was the place of the Second Shrine. It was also designated as a Important Cultural Properties of JapanW on this recent relocation. The Main shrine still remains at 2nd station on Mt. Fuji. 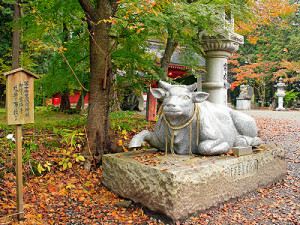 Photo from Fuji Omuro Sengen Shrine Official Site. 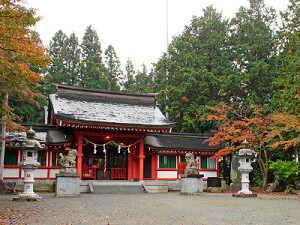 The shrine’s name, ‘Omuro’, meaning a chamber surrounded by stone pillars is thought to have been named because of the ancient style of enshrining the Shinto gods, which is one of the evidence that this shrine is very old. The hero of old Yamanashi, Kai provinceW, Shingen TakedaW had worshiped the goddess of Mt. Fuji, Konohanasakuya-himeW and had written and signed a petition, wishing his beloved wife would give a birth to their child safely. 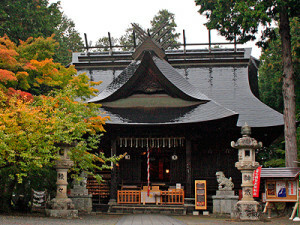 The shrine was worshiped by Takeda family for 3 generations. 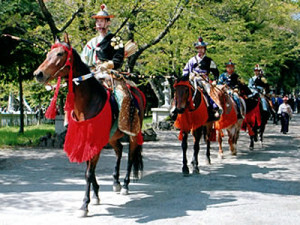 The place is also famous for YabusameW, a traditional Japanese archery mounted on a running horse. It is held every 29th April, during the Golden Week (Japan)W holiday season, one of the great festivals of the area. Yabusame started to be performed in this shrine when Fujiwara no HidesatoW suppressed the great rebellion of Taira no MasakadoW in 940. It was he who first performed Yabusame in this shrine in order to celebrate the victory. 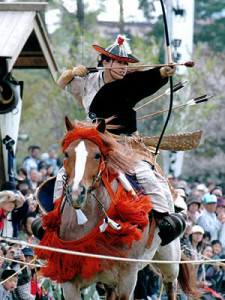 Yabusame archer aiming at the mak on horseback. 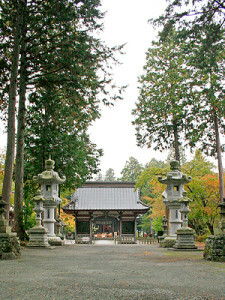 Photo from Fuji Omuro Sengen Shrine Official Site. Archers marching on horseback. 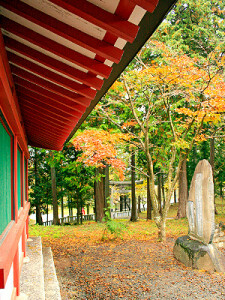 Photo from Fuji Omuro Sengen Shrine Official Site. In Sengoku eraW, Yabusame was one of the techniques on fighting in battlefields but when the peace reigned the land, Yabusame became a sport to please and entertain the myriad of gods, thus encouraging their blessings for the prosperity of the land, the people, and the harvest. A Yabusame archer gallops down a 255-meter-long track at high speed. The archer mainly controls his horse with his knees, as he needs both hands to draw and shoot his bow. As he approaches a target, he brings his bow up and draws the arrow past his ear before letting the arrow fly with a deep shout of “In-Yo-In-Yo”, meaning ‘darkness and light’. The arrow is blunt and round-shaped in order to make a louder sound when it strikes the mark. Finally, you can hold your wedding ceremony in this shrine like other major shrines in Japan. 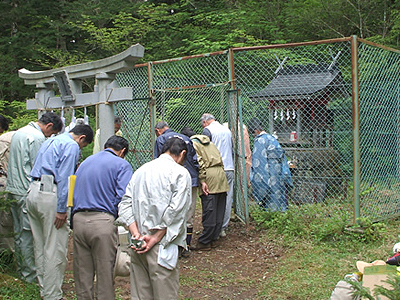 It would be better to be Shinto follower to hold a ceremony but unlike the most of the other religions, many Shinto shrines welcome other religion followers. If you are willing to hold a ceremony, reservation is required in advance. Fuji View Hotel has a nice wedding plan with this shrine. 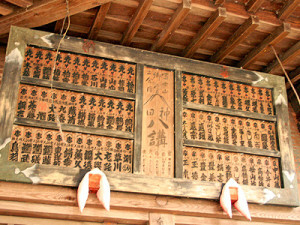 Address : 3951 Katsuyama, Fuji Kawaguchiko-machi, Minamitsuru-gun, Yamanashi Pref.